Comments for Arrival in HongKong International Airport at 1:00 AM what transportation to take in going to BP International hotel and how much? WE are 4 of us coming to HK for the first time, staying at BP Intnl for 7 days. We intend travelling to all the tourist attractions on our own as we are not coming with a tour group. Would it be advisable to buy an Octopus card?? How much of travel does that cover? Your response will be a big help. Thanks! The most efficient way to travel between Chungking Mansions which is located 36-44 Nathan Rd, Tsim Sha Tsui and HK Disneyland located in Lantau Island is thru MTR trains. Don't worry, there's NO limit for number of regular size of luggage to be carried along when taking the MTRs. 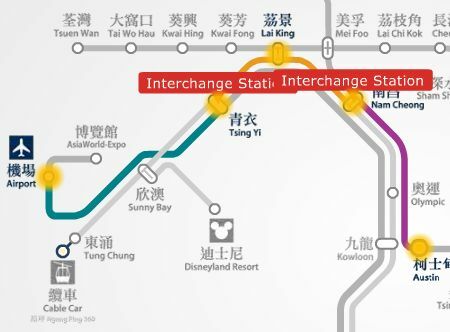 Get into the Tsim Sha Tsui MTR station (thru Exit G or E) --> Tsuen Wan Line train and get off at Lai King station --> change to Tung Chung Line and get off at Sunny Bay --> change to Disneyland Resort Line to Disneyland (38 mins @ HK$17). OR, it is also a good idea to take a taxi. Taxi can accommodate 5 persons so your group needs 5 taxi cabs. Taxi travel time is about 31 mins and cost around HK$180 + HK$5 for each piece of luggage. I suggest you purchase an Airport Express Travel Pass since you'd be staying for 3 days only. Please refer to the post above dated December 2, 2011. Hong Kong has a lot of good food so don't miss out on a food trip. Just choose where you eat. Here's the most recommended places for HK dining. We are a family of four arriving in Hong Kong on 28th March for 3 days,staying at BP International, is it worth purchasing an octopus card or shall we just get a travel card. We have been told not to eat anywhere but in hotels? Great! Thank you for all of the information and for clearing up that the Airport Express Travel Pass is different from the Octopus Card. I really thought it is a type of an Octopus Card. Will definitely take the Octopus Card. Airport Express trains are designed for comfort and they have plenty of luggage storage space so you may bring in as much luggages as you want. You may purchase Octopus Cards at any Airport Express or MTR Customer Service Centre. And yes, you're right. You may conveniently add value to your Octopus Card. You don't have to worry about luggage size to be brought along when taking the MTR trains. Based on my experience, one time they asked me to pay an extra HK$20 because I was bringing along stuff that measures about more than 2.5 meters long. Basically, you can carry things up to 2 meters long without any problem regardless of the weight and no. of pcs. Getting an Octopus Card is quick and easy, just proceed to the Airport Express counter that you can find when you get to the HKIA arrival hall, just follow that link for more details. Please be informed that the Octopus Card is different from ff tickets offered by MTR that suits your preference. a.) "Airport Express Travel Pass" (1 or 2, 1 or 2 designated journeys on the Airport Express + plus 3 consecutive days of unlimited travel on MTR @ HK$220 and HK$300 respectively). b.) "Airport Express Single Journey Ticket" A single journey trip to (Tsing Yi station = HK$60; Kowloon Station = HK$90; or Hong Kong Station = HK$100). c.) "Tourist Day Pass" Ticket entitles any 1 day of unlimited travel on MTR and Light Rail @ HK$55. If you stay more than 3 days in Hong Kong, I suggest you get the Octopus Card. Hi! I guess the cheaper and best option to travel from HKIA to B P International Hotel is through MTR after reading it here, but how much luggage is allowed? size or kilogram? And where can we buy Octopus Card in HKIA? If we'll purchase Airport Express Two Free Single Journeys # + 3 days unlimited travel on MTR + $50 deposit + Stored value $20 = Price HK$300, meaning if we'll be staying for 4 days, we just need to top up the card and store value to be able to use it for the 4th day right? There's NO free shuttle bus that serve direct from HK airport to BP International hotel. It is the only when you take the Airport Express trains that has an extended free shuttle bus services. It is a complimentary add-on service provided exclusively for Airport Express passengers travelling between Hong Kong or Kowloon station and major hotels and railway interchanges which includes BP Int. hotel with the route (K4). Just wanted to make clear about the previous posting that stated Airport Express + MTR trains should be Airport Express train to Kowloon station (21 minutes @ HK$90) + Free Airport Express shuttle bus route K4. And yes, it will drop you off in front of the hotel. Hello. I read in one site that there is a free airport bus service to & from the airport and BP International Hotel (K4). What are the conditions to be able to get into this bus? Will the bus drop us off directly infront of the hotel? I'm also wondering why this option has never been mentioned here in the thread? Thank you for the advice! Our recommended way of transport from HKIA to BP International hotel is thru Airport Express + MTR trains as stated above but I assume you wanted to take hotel Airport Shuttle Service that cost HK$110 per person per trip including 2 pieces of luggage. Here's to read more details about this option including the shuttle time table. We'll arrive in Hong Kong International Airport (HKIA) at 11:00 AM. What transportation to take in going to BP International hotel and how much? Hong Kong B P International hotel is situated at 8 Austin Road, Tsim Sha Tsui, Kowloon, Hong Kong close to the Huanggang Cross Boundary Bus Terminus. The most efficient way in getting to the Hong Kong B P International hotel from Hong Kong International Airport (HKIA) is through Airport Express trains + MTR trains. Total train travel time is 32 minutes, HK$ 60 (using an octopus card). Airport Express trains to the city will start to operate at 05:54 in the morning. So I think you need to stay for a while at the airport until then. Otherwise, you can take a taxi from the airport straight to the hotel for about HK$ 300 fare plus any luggage for HK$ 10 each - not recommended. From HKIA, take the Airport Express trains and get off at Tsing Yi MTR station. Interchange trains to the Tung Chung Line trains going towards Hong Kong station and get off at Nam Cheong station. Finally, interchange trains to the West Rail Line trains towards Hung Hom station and get off at Austin MTR station then take exit F. Look for directional signs going to the hotel for about 5 minutes walk (See walking route map below). Here's the Hong Kong B P International hotel location map and nearby point of interest.